Canadian artist Chris Cran has become known for challenging gallery viewer expectations. The New York Times has said that Cran “has built a career on tampering with people’s perceptions,” and declared that the artist fully realizes the power of painting. A new exhibition at Wilding Cran Gallery, “That’s An Excellent Question!” will showcase 31 new paintings by Cran, with each work playing on optical illusions, and as the exhibition’s title suggests, prompting contemplation. Cran considers these new paintings a continuation of his previous “Chorus Series,” named for the chorus in ancient Greek tragedies, a panel of actors who comment on the dramatic action of the play. Like those of the Greek chorus, Cran’s faces often display many moods, ranging from excitement to disdain to surprise, and are intended to be placed around other works, which in jest allows the paintings to “comment” on the exhibition itself, likening the exhibition to a theater. 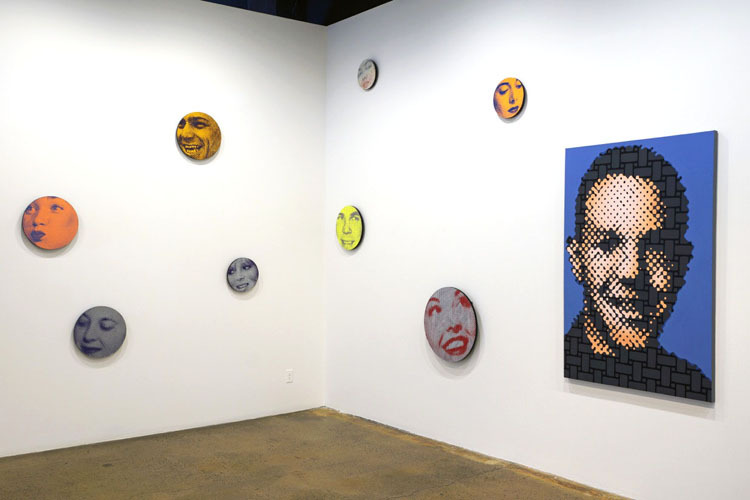 Many of these optically daring paintings of faces use oval or round canvases that are almost reminiscent of mirrors—or a nod to Renaissance tondo compositions. These works as well as rectangular canvases featuring still life imagery—a cluster of lemons, flowers in a vase—are realized through careful patterning that creates varied interpretations of the photographic image, resembling newspaper print images in some works and fuzzy television screens in others. Beige/Purple Woman (2014) features a woman’s face stretched to fit an elongated oval; she looks apprehensively to the side, as if she’s nervous about what will happen next. Beige/Brown Woman (2014) features another female face cropped closely within a circular canvas; she could be asleep, looking downwards, or deep in thought. When they’re isolated, these works leave viewers wondering; about the the unseen life going on outside of these cropped forms, and about the characters and stories that they encapsulate and conceal. Together though in the exhibition, the works are in visual conversation; hung on the gallery walls at varying heights they evoke the idea of floating putti or cherubs. Their stolen glances and startled reactions are correlate to one another, and the scattered still lifes and poster-like images—two faces are delighted to see the smiling faces of The Beatles. A feast for the eyes and the mind, the show is an immersive visual and contemplative experience, where the viewer seems to be caught in the crossfire; as the artist told the New York Times, “The eye loves to apprehend space, something that visually is not materially how it appears to be. When I first viewed Chris Cran’s paintings in a survey show at the Kelowna Art Gallery in 1998, something pricked my senses. It was not just his adroitness and competency working at large scale. More intriguing was how his portraiture both baffled and beguiled. In his latest solo show, Candidates and Citizens, these tenets still hold true. But what about the depth of his practice: what underpins the content? For instance, how does the incorporation of lens-based media fit with his oeuvre, and after 35 years in the field, what’s at stake? Cran, who is based in Calgary, emphasizes that his work is not all about paint. At the outset of his career, he earned money by undertaking portrait commissions rendered from projected photographs of his subjects. Thus started a four-decade foray into representation and perception, a trajectory that has seen him progress through figuration, painterly twists on genres such as still life, landscapes, crowds and hand gestures, often in the service of abstraction; and, more recently, photography and collages that, although produced as digital editions, are rendered with painterly aplomb. As with much of the earlier work, Candidates and Citizens is manifest with formal references to Pop Art: blocks of colour, a giant speech bubble and graphic illustrations fill the main gallery. But the work is far from illustration. 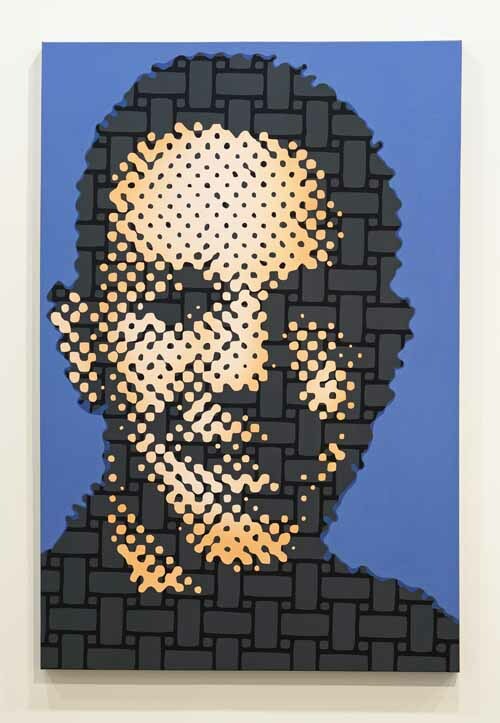 Although many pieces are rendered in half-tone dots – a technique associated with photographic reproduction, but different than Lichtenstein’s use of Ben-Day dots – the images, whilst emblematic of fame or celebrity, have no discernable identities. The faces Cran depicts are appropriated from the everyday, and then re-articulated as both a collective and as a series of individual characters in conversation with one another, their gazes shifting around the room. The distance between art and audience is key. From afar, the 12-foot-wide The Candidate Sez presents a blurred-out face in soft contrast to the hard, black edges of a giant speech bubble and attendant portrait. But on nearing the picture plane, the composition begins to buzz, forms appearing as if edged by pinking shears. What’s left is the sense that there’s a conceptual concern with appearances behind the buzz of many candidates’ grandstanding. A nod and a wink from the artist: Size matters, but so does substance. The National Gallery of Canada has collected four of Cran’s works over the years. In 2012, it acquired five additional pieces on paper and, this year filled out its inventory with four more significant works, including some from previously collected series. The substance of Cran’s practice appears consolidated. With talk of another survey show, keep an eye out for what’s at stake: the role of public citizenry is key. Chris Cran's painting, Large Orange Laughing Woman (1991), is featured on the cover of the Odds' latest album, The Most Beautiful Place on Earth. The video production of Loved by Millions coincided with the development of Chris Cran's exhibition of the same name at the AGW in 1989. Created by the artist's long-time friend and colleague, painter John Will of Calgary, the video production playfully responds to the documentary tradition, featuring artist-subject, Chris Cran. John Will is a prominent artist known best for his works in painting, his critiques of popular culture, his humorous and ironic means of visual resolution. Will's Loved by Millions traces the journey of Cran by air from his home city of Calgary to Detroit, and then by limousine to Windsor, to attend the opening of his 1989 solo show with his broker-agent and chic. Chris Cran is included in The Canadian Encyclopedia. Calgary prepares to play host to Andy Warhol, icon of Pop art for an exclusive, limited engagement. Legendary Athletes are paired with a legendary artist at the Museum of Contemporary Art Calgary (MOCA) as MOCA Calgary presents the full suite of 10 Warhol paintings in his Athlete series supplemented by related works from Alberta collections. Organized by MOCA, Calgary is the sole Canadian venue. The Warhol series features paintings of sports stars: Muhammed Ali, O.J. Simpson, Pele, Jack Nicklaus, Dorothy Hamill, Kareem Abdul-Jabbar, Chris Evert, Tom Seaver, Willie Shoemaker, and Rod Gilbert. The series was commissioned in 1977 by Richard Weisman, a New York investment banker who befriended Warhol in the 1970s; it fashions a snapshot of some of the dominant sports figures of the decade. Weisman who combines a passion for both art and sport wanted to do something to bring together these two often disparate worlds. Weisman took on the role of selecting the athletes and bringing them together with the artist. Warhol and Weisman travelled together all across the USA to meet and create the athlete portraits. More than simply the financial ‘producer’ Weisman acted as liaison smoothing relations between the artist and his subjects. As complement to the Warhol works on view from Mr. Weisman’s collection, we present: Great Moments in Pop: featuring works by Warhol from Alberta collections. Further, this adjunct exhibition presents the work of respected Calgary artists that reflect upon the multiple themes of sport and art as well as homages, riffs and variations upon signature Warhol themes and styles (including Shelley Ouellet, Chris Cran, John Will and Billy McCarroll). Also see Kyle Shewfelt's post on the exhibit here. Chris Cran is now represented by Wilding Cran, a new Los Angeles based gallery founded by Naomi Wilding and Anthony Cran. Builders presents more than 100 recent and significant acquisitions by emerging and established artists instrumental in shaping perspectives in Canadian art today. The exhibition reflects the work of the Gallery’s curators in building the collection through an informed understanding of contemporary Canadian art across diverse media, environments and generations. Organized by the National Gallery of Canada. 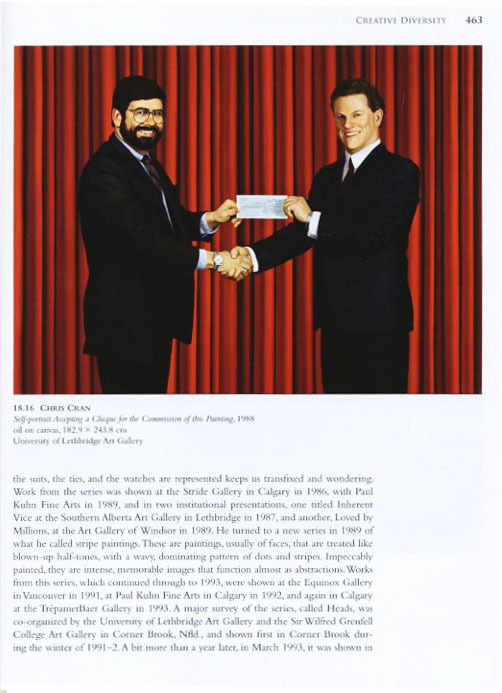 Chris Cran is included in A Concise History of Canadian Painting. As soon as he left the University of Western Ontario and landed a job, Peter Boyd bought a car, some furniture and his first work of art. He has since spent “hundreds of thousands” of dollars on his art habit, running out of wall space at home and keeping much of his collection in storage (necessitated, in part, by the 2009 sale of his oil-field seismic-services company Arcis Corp., and the subsequent disappearance of office walls on which to hang the work). Influenced by childhood trips to the McMichael Canadian Art Collection in Kleinburg, Ont., he began his collection with historical work by artists such as David Milne, but has sold or gifted most of it and now exclusively collects contemporary art. 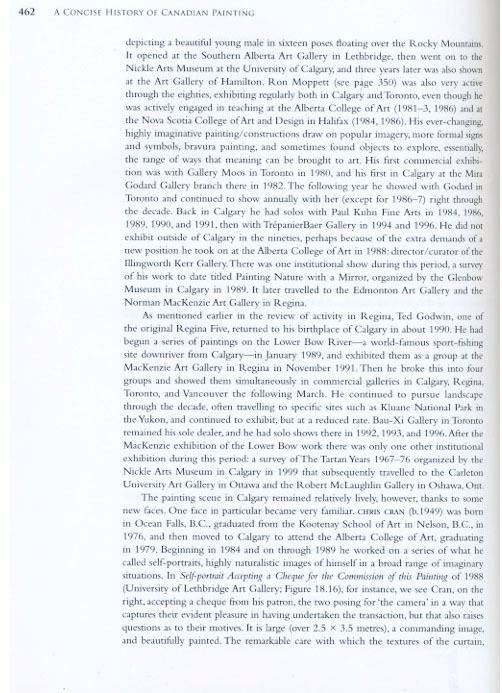 His collection of about 100 works (it peaked at about 200) is populated with artists connected to the Canadian West, including Chris Cran, Douglas Coupland, Attila Richard Lukacs and Geoffrey James, but he also owns work by Robert Mapplethorpe and Eric Fischl. “You’re always falling in love with art if you love art,” he says. May 17, 2011 (Calgary, Alberta) - The Alberta College of Art + Design (ACAD) is pleased to announce that the 2011 Board of Governors’ Alumni Award of Excellence will be awarded to Norman Faulkner, Alex Janvier and Chris Cran at the 2011 ACAD convocation ceremony on May 19th, 2011. This award is given annually to an alumnus or alumna of ACAD who has made a significant contribution to the arts community and has demonstrated excellence in their field of practice. The Board of Governors of ACAD is especially pleased to recognize these three key members of our alumni community with this award, and to honour the important contributions they have made to the arts and to the fields of craft internationally. Mr.Faulkner, Mr.Janvier and Mr.Cran were each was nominated based on their work in establishing new and important areas of the arts for Alberta, and for Canada, for the dedication and support they have given to the artistic community and for the establishment of their own active practices as a visual artists. "If Something Appears To Be Photographic It Is"
Cran's new works will appear in a solo exhibition 'If Something Appears to Be Photographic It Is' at the Trepanier Baer gallery in Calgary, Alberta. March 25th - May 1, 2010. See review of 'Bright Spiral Standard', Cran's solo exhibition at Clint Roenisch Gallery, on page 8. The Toronto Star Reviews "Bright Spiral Standard"
The first time I saw Chris Cran's work up close and personal was in, of all places, Owen Sound, at the Tom Thomson Memorial Art Gallery in 1999. Cran's touring retrospective, Surveying the Damage, 1977-1997, was orbiting the city of Toronto proper (the closest it got to downtown was at MOCCA, back when it was in North York), and the Thomson gallery was a curious fit -- or so it seemed: Cran's a painter, of course, but the closest thing to landscape I saw in that show was one of Cran's elaborately popist, cartoony self-portraits, in which the artist, decked out in trademark fedora and blazer, his face turned from view, wallowed in a waist-deep in a swamp, armed with a wooden rifle. Alongside him, a troop of Amazonian women wearing only ammo belts laid waste to an army advancing from a nearby village, shooting from the hip with their AK-47s. He called it "Self-Portrait with Combat Nymphos of Saigon;" it was equal parts 70s-era Nick Fury comics and Russ Meyer movies (and no parts Group of 7), and as instructive an entry to Cran's oeuvre as any. Over a quarter century, Cran, a Calgarian, has been a veritable genre mixmaster, playfully mixing elements of pop art with some clever deconstuctions of the form itself. For a show of new work at the Clint Roenisch Gallery, which opened last week, Cran offers some new twists on some old tricks. Amazons aside, the show features several portraits that would be familiar to anyone who knows his work: Rough, photographic-seeming portraits, often dot-matrix style, like a newsprint blow-up, tracked with bright vertical lines. There's an obvious formal conceit here, of course, as Cran processes photography through painting, giving it an indistinctness alien to the notion of the form; at the same time, he's exploding painting's myth of perspective, offering it in the image, then taking it away again with the vertical bars that completely flatten perspective back down to the plane of the canvas. In true trickster form, Cran puts a fine point on it in Awake (2009), at right, skewing a crude line-drawn portrait overtop the traditional rendering; so withdrawn from the surface, it seems almost underwater. Cran can be heady, questioning the very nature of the medium he's devoted his practice to; at his best, he's a polemicist, tackling the aesthetic debate about representation, and the Classical/Modern/Postmodern rifts all at once; but none of this would mean a thing if his work wasn't so darn engaging. Staring a Cran portrait in the face can be a dizzying, almost Escher-esque experience, as your brain tries to square the competing perspectives your eyes are delivering to it for processing. Cran presents a multi-layered practice in theory, but the fact he can put it all together, right in front of your bewildered and bemused eyes, is what makes him great. The Calgary Herald Reviews "Diversions"
Nancy Tousley, art critic for The Calgary Herald, reviews Cran's solo show 'Diversions' at Trepanier Baer. opens up amazing space in the flatness of the painting surface to create ever more unexpected and elusive depths. The paintings fall into the series he calls "Abstracts," with a nod to a category of kitsch art, and one or two of them are among his best. But while this solo show is full of new work, as one would expect, it also has the feel of a mini retrospective. The exhibition contains four significant early works: Charts (1985), from the Self-Portrait Series; Four Portraits of the Artist by Andy Warhol #6 (1988), from a series within the Self-Portrait Series; Large Orange Laughing Woman (1991), from the Half-tone Series; and Alibi (1993), a diptych that Cran made just before his first show at TrépanierBaer, in which he switched from making representational painting to Abstracts. Two other paintings, Island (2000) and Wall With Portrait & Curtain (2006), are from series in which Cran explored the framing device and painting genres. Another, So Many Canaries (2007), an all-yellow enamel painting on board with toy birds attached to the surface, reprises an idea he had while still a student at the Alberta College of Art, where the first Self-Portrait Paintings also was born. The little history is satisfying to see. The exhibition might not hit every major phase of Cran's work, but it provides a terrific crash course in his preoccupations as a painter for more than 25 years. It is telling to see how well the paintings grouped in the front hall and first gallery hang together. 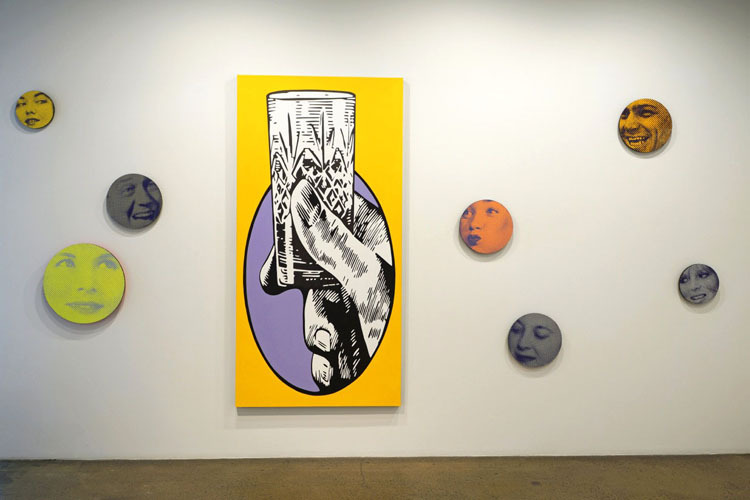 With their references to 1940s and '50s illustration (Charts and Alibi), mechanical reproduction (Large Orange Laughing Woman) and cartoony or pop art (Four Portraits of the Artist by Andy Warhol), the older paintings stake out a large portion of Cran's territory and its references. The new work in this gallery, a trio of Abstracts called X, Y and Z (2009), claim kin with their Pop-flavoured layers of neon graffiti, which force the eye to perform contortions to focus on the different levels of the composition. The grouping foregrounds Cran's abiding interest in the fluidity of perception and images. In Charts, his persona is seen from behind studying sheets of drawings of eyes, noses and mouths, as if he were composing a face for himself from these features. This is a visual narrative about the fluidity of images. The other paintings work on the viewer's perception in a different way. This is the magical effect that Cran brought to his painting in the 1990s and has continued to develop. It is no mean feat. 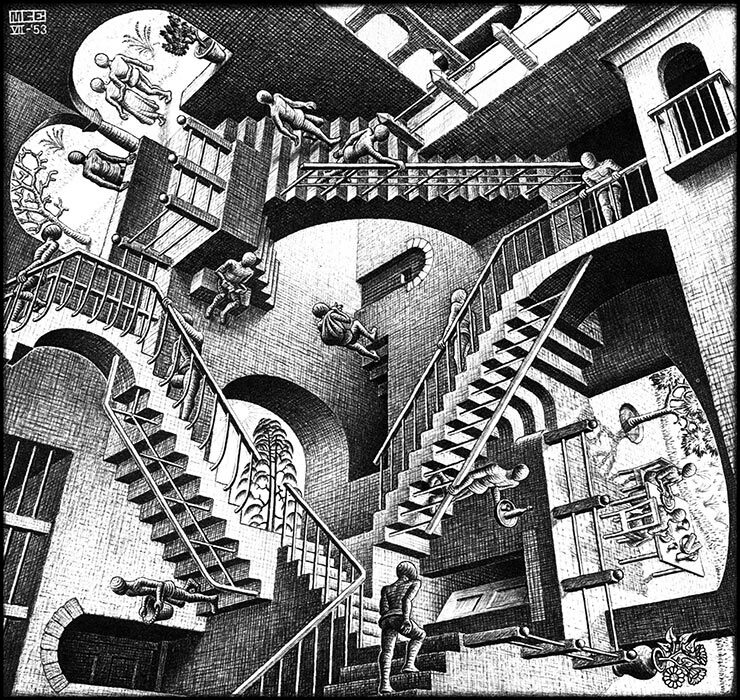 In the interplay of light, surface and depth in a painting, something actually happens, a perceptual event occurs. Painting as a static, iconic image becomes unfixed. Painting might, in the end, be a commodity but for Cran is first and foremost an experience. The Half-tone Painting of the large head comes into focus as an image and disintegrates into dots, depending on the viewer's distance from the painting. The Abstracts, X, Y and Z, and other new paintings in the show produce more complex perceptual events. These paintings change dramatically as you move past them or view them from different angles. Painted shapes flip from positive to negative and back again. Colour changes with changes in the available light. X, Y and Z, which like the Large Orange Laughing Woman are covered with vertical stripes, are the most complex and elusive. As the surfaces of the paintings interact with light, the images--which Cran creates by dragging the brush through the light-reflecting paint to make waves, zigzags, half circles, horizontal bands, vertical scrapes--become mercurial, metaphysical even, and beautiful. The rhetoric of painting, the ways in which painting persuades the eye, has long been the subject of Cran's work. The range of this excellent show tracks it from the realist illusion of representational painting, as in Charts, to painting in which process and the materials and tools of painting create illusion independent of representation. Their abstract images, which are in constant flux, are the result of the tracks of a brush, the traces of a process, and light, which represent nothing else at all.